I BOUGHT THIS FOR WHEN I FLY. I'LL TUCK IT INTO MY PURSE TO GO THRU TSA. I NEED HYDRATION ON THE PLANE. Great water bottle for travel! I purchased the collapsible water bottle for a recent trip via plane. I was able to stay hydrated my entire trip which is always a challenge. I am buying more to give as gifts. Perfect for getting through airports and TSA. Flattens to a nice compact size then holds a good amount once filled. My grandkids LOVE to play with it and always want it to be their water bottle. I appreciate being able to run it through the dishwasher for a thorough clean. This wonderful item folds up small and flat. At airports, you can fill it from drinking fountains or with the leftover ice from your restaurant drink. Then it collapses again, to be hidden in a pocket or backpack. It is a wonderful invention for people who know the importance of not getting dehydrated as you're away from home! I got one of these for everyone in our family. We travel a lot and easily fit in a coat pocket or clip to a back pack to fill up once past security. This is perfect to fill with water after I've gone through TSA. Another wonderful item. I love it when I travel, go hiking and for yoga retreats as it won’t spill. I love this water bottle. Please bring back the purple one! Buying bottled water is bad for the environment and your wallet, but it’s convenient because you don’t have to carry around a bulky, empty bottle when you’re done. 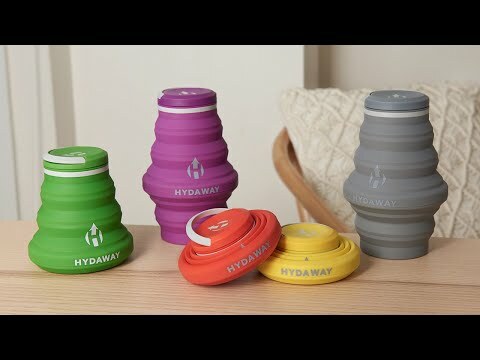 Hydaway is a reusable, collapsible water bottle with the same convenience. Fold it up when you’re not using it. It’s compact enough to forget about. Founder Niki Singlaub wanted a water bottle that he could put in his back pocket, but couldn’t find one. With over 20 years in product design and development, he made his own. Made of flexible, durable silicone that won’t interfere with water’s taste, Hydaway collapses like an accordion to just over an inch high. Put it in your purse or jacket pocket or clip it to a backpack with the carry handle. 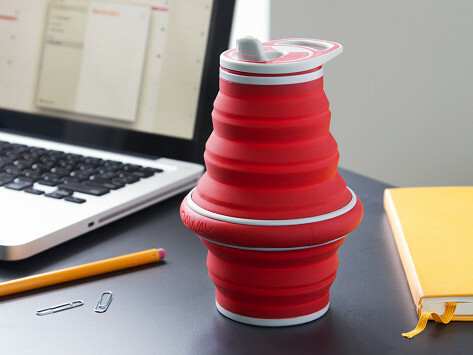 It’s leak-proof, dishwasher safe, and the narrow base lets it fit in most cup holders. Drink from the nozzle or unscrew the top and use it like a cup. Hydaway is great for kids and travelers, but it’s convenient anywhere—at work, the beach, or even mountain climbing.